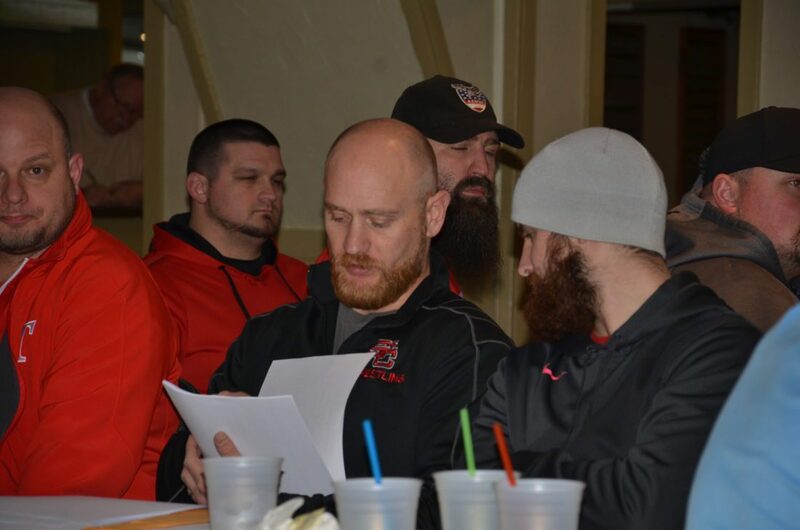 ST. CLAIRSVILLE head coach Joel Sansone looks over his brackets during a press conference Sunday night for the 66th annual OVAC Ron Mauck Wrestling Tournament. The three-day event gets under way Thursday inside downtown Wheeling’s WesBanco Arena at 6 p.m. and runs through Saturday night’s championship finals. WHEELING — It is officially Ohio Valley Athletic Conference Wrestling Week as seeds for the 66th edition of the OVAC Ron Mauck Tournament were released Sunday night during a press conference inside Generations Restaurant. As has been pretty much the case since it joined the OVAC, Parkersburg South leads the way with 13 seeds, which include a tournament-high four No. 1s. However, Beaver Local also had 13 grapplers seeded in the top 12 of their respective weight classes, including a trio of top seeds. The Wood County Patriots have captured the team and Class 5A championships in each of the last five seasons and eight of the past nine. They piled up 324.5 to Beaver Local’s 240 last year. Steubenville won the overall and Class 4A titles in 2013, but South was the 5A champ. South’s top seeds include returning champions Brayden Roberts (145) and Braxton Amos (220), and Zane Hinzman (160) and Louden Haga (285). Another defending champ — senior Tucker Windland (126) — is seeded fourth in a very deep weight class. The Beavers No. 1 seeds are junior two-time defending champion Cole McComas (126), freshman phenom Logan Ours (120) and senior Beau Smith (170). McComas is also a two-time Ohio Division II state runnerup. The Beavers also have five second seeds. Wheeling Park checks in with 12 seeded wrestlers, which is one more than Steubenville. Despite not having a No. 1 seed, the Patriots did receive two thirds in Billy Gooch (152) and Dylan Wood (220). Big Red’s 11 seeds include a No. 1 in Anthony Rice (152), who is also ranked No. 1 in the state by BoroFan. The senior is also a defending champion. Steubenville also has four No. 2 seeds. Other top seeds include Shenandoah’s Alex Overly (106); East Liverpool’s Howard Williams (113); University’s Jacob Simpson (132); Oak Glen’s Peyton Hall (138); John Marshall’s Anthony Carman (182); and Madonna’s Garrett Cook (195). Williams and Carman won titles at 106 and 160 last year, while Hall was a titlist as a freshman when he became the first frosh to win the coveted Bierkortte Award as the Most Outstanding Wrestler of the tournament. The three-day event begins Thursday at 6 p.m. with Olympic-style opening ceremonies. Wrestling starts at 6:30. On Friday, action resumes at noon and then again at 6 p.m. Saturday begins with championship semifinals at noon. The night session kicks off at 6 with the naming of Mr. Mat. The championship finals are slated for 6:30.